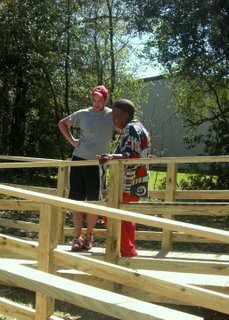 A homeowner on her new ramp. Our Ramps & Rails program was initiated in 2006 to provide elderly or disabled homeowners with access ramps, railings, and grab bars for safe home access and fall prevention. These renovations are done according to the construction standards set by the Americans with Disabilities Act of 1990. We are currently accepting applications for the Ramps & Rails program. Click here for information on how to apply.